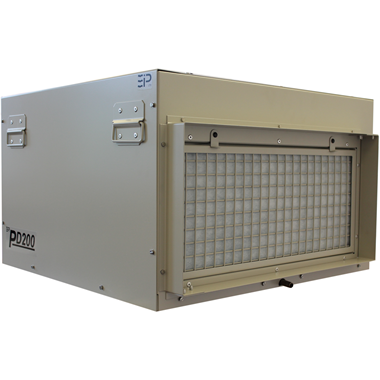 A Powerful HVAC Ducted or Room Dehumidifier with Up to 190 Pints Per Day Moisture and Humidity Removal, 664 CFM, Over 21,000 Cubic Foot Coverage, Gravity Drain. Great for Large Home Air Conditioning Systems, Pool Rooms, Spas, Commercial Buildings & More, All at a Discount Price with Free Shipping. Compact and Portable - easy to move around at job sites. Low-Temperature Operation: Performs well at low temperatures, as low as 33 degrees F.
Homes and buildings with water damage, leak or other sources of excess moisture need strong dehumidification to reduce moisture levels as well as get rid and prevent future mold and moisture damage. Homes with pools and spas often have chemicals and water vapor evaporating into the air and being drawn into the home, ncreasing indoor humidity and chemical pollutant levels. This high, humid air, and possibly loaded with chemicals, will condense on your walls, roof, floor and windows causing corrosion, wood rot, mold and bacteria growth and an unhealthy environment. To protect your property investment, the EBAC PD120 HVAC dehumidifier can help you quickly dry out your home and keep it dry all year long . 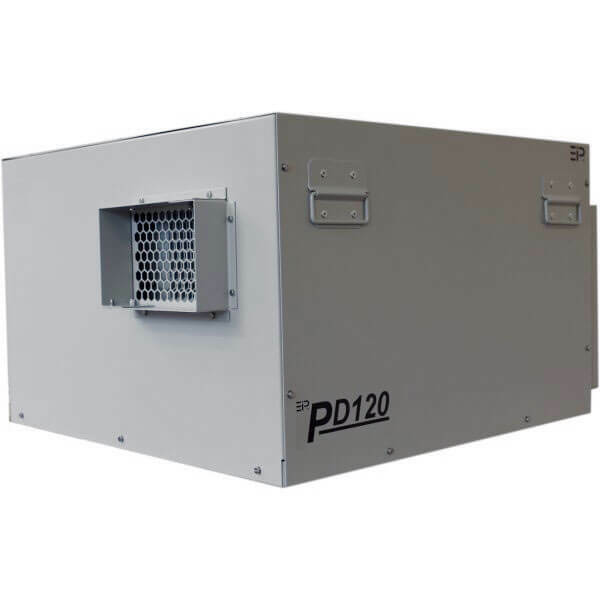 The PD 120 features extra strong 190 point per day moisture removal, completely enclosed coils in an epoxy-coated, heavy gauge steel case for a rugged, heavy duty dehumidifier that be used to reduce indoor moisture for a varirety of applications. Underside runners, with predrilled mounting points, along with optional duct flanges allow easy installation to just about any HVAC system or setup in a room to draw humidity out of a space, exhausting outside the space, etc. An adjustable control humidistat is included to set and maintain the level of dryness, A convenient drain point for condensate collection makes getting rid of excess water a snap. The PD Series unique temperature sensitive “Reverse Cycle” defrosting feature automatically melts away frost buildup providing effective operation at low ambient temperatures, Quiet 2 speed fan, ducted intake and output, and sturdy military-type carrying handles make for easy, reliable and doesn't create bothersome noise. Order your EBAC PD120 HVAC / Room Dehumidfiier here at a discount online sales price and enjoy fast, effective moisture removal in a variety of residential and commercial applications. There are not many official online retailers of EBAC USA products and unfortunately the internet is full of scams. As a general rule of thumb, if the deal seems too good to be true, it probably is. Cheap cut rate online deals often end up being a used or refurbished unit, which do not come with EBAC USA's top rated warranties. Or even worse, you may end up buying a cheap discount air cleaner that doesn’t have the energy efficiency, features or warranties provided by top-rated EBAC USA products. Our innovative partnership with EBAC USA allows us to ship directly from their warehouse, which cuts out the middle man and eliminates the high operating costs of traditional brick and mortar big box stores. These savings get passed directly to you, allowing us to offer brand new allergy and asthma symptom-eliminating EBAC USA products at the best possible everyday cheap discount online sales prices. And buying from us is definitely better than direct--if you buy direct, you'll have to pay shipping. Buying from us, you always get fast free ground shipping as our thanks to you for shopping with us. If you have any questions give us a call or send us an email and one of commercial indoor air purification experts will be happy to help!